The wide leaves and growth habit inspired the common name of this houseplant. 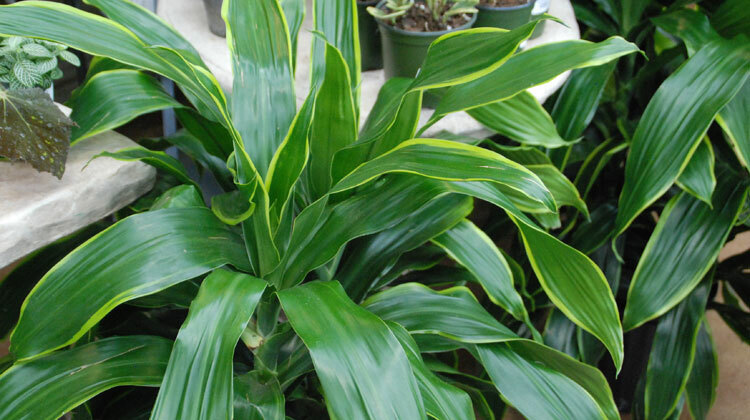 Corn plant, known botanically as Dracaena fragrans, is worthy of a spot in your home. Place small plants on a tabletop. Or go big and purchase a larger plant to brighten a bare wall or fill an empty corner. Grow your corn plant in a brightly lit location. They’ll tolerate low light, but the leaf color will be less intense and the plant will grow slower. Water your corn plant thoroughly when the top few inches of soil begin to dry. Pour off any excess water that collects in the saucer. Group it with other plants or set the pot on a gravel tray to increase humidity around the plant. Avoid brown tips caused by fluoride and chlorine in the tap water by keeping the soil slightly moist or using rainwater or distilled water. A bit more information: Corn plant is one of the 15 plants evaluated by NASA and found to be effective at removing toxins from the air. Grow these and other indoor plants to improve indoor air quality, elevate your mood and reduce stress.